I think one of the hardest things in daily cooking is making and eating a solid lunch. I have no problem with breakfast and feel solid in my dinner game. And yet, when it comes to the mid-day meal, I’m either really on it or eating out. These chickpea curry stuffed pita are one of the meals I come back to time and again. They are fast and can be made with a myriad of different spice blends. Best of all, these stuffed pita are a solid make-ahead option for packing your lunch. The key to these stuffed pita is in the spice blend. While I love them with the chickpea curry, you could easily swap the curry powder for a jerk, berbere, or harissa seasoning. I’ve found the dill-yogurt sauce works well with all different kinds of blends. Plus, this recipe gives you a base to try out a few different options. For this specific recipe, I used the general curry blend from Frontier Co-op. It’s a solid mix of flavors and spice level. If you’re new to sourcing spice blends, you have a quite a few options. One of my go-to is Frontier Co-op (which I can pick-up at my local co-ops/Whole Foods). There are also a few spice companies that I like if I’m looking for something special. Oaktown spice shop, Whole Spice, Penzey’s, and The Spice House are just a few to get you started. This step is completely optional but if you spend any time with me, you know I’m pretty passionate about home-cooked beans. The flavor is SO much better than what you get in a can. Make a perfect pot of beans, freeze in freezer-safe containers (I love the pint ball jars– it’s about the size a can would be), and thaw/use as needed. As for the sauce, this is not a one-recipe only kind of sauce. It’s my go-to yogurt sauce for all things dipping and topping. I love making a batch of this sauce for use with these brown rice cakes or these potato quinoa cakes. Just be sure to follow the directions and let the sauce rest while you whip up the chickpeas. The flavor of the sauce really develops as it rests. Also, one quick note- if you’re not a raw garlic fan? Sauté minced garlic in a small bit of olive oil until fragrant and golden then add it to the yogurt! There are two options for making this stuffed pita ahead of time. If you’re looking to take it for lunch, make it as is but wait until the chickpeas are cool before adding to the pita. Then, place in an airtight container and head out. If you’re looking to prep this well in advance, leave everything separate and assemble day-of. Cook the chickpeas, make the sauce, then store in containers. Don’t let leftover Arugula go to waste! Finally, one of my favorite, easy variations on this lunch is to swap the pita for a grain bowl. 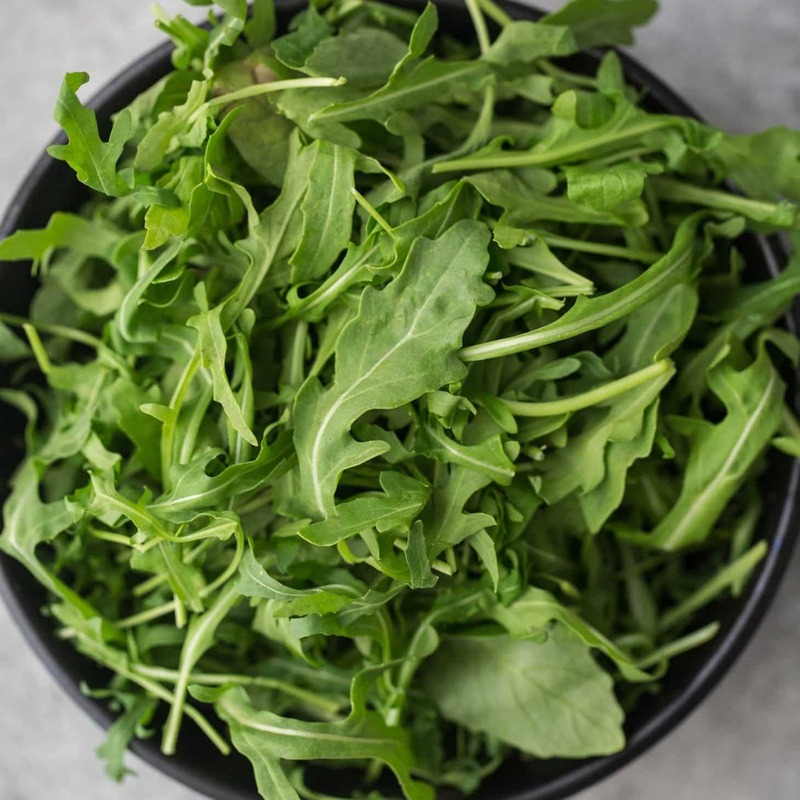 Add the arugula to a bowl along with your favorite cooked grain such as quinoa or brown rice. Top with the chickpeas and finish with a drizzle of the yogurt sauce. What about if you’re trying to keep this dairy free/vegan? No problem! Swap out the yogurt for an easy homemade cashew cream! Looking for a quick, 20 minute lunch that is light on ingredients but solid on flavor? 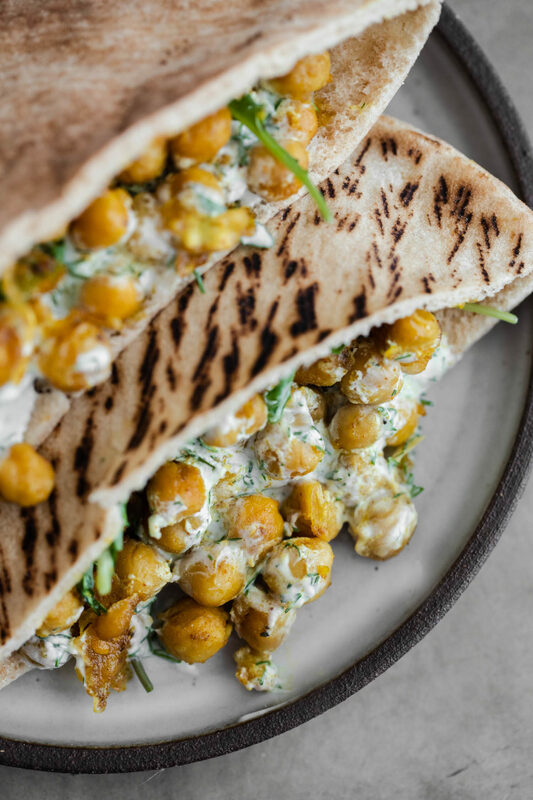 This curry chickpea stuffed pita is just right for you! Finely mince the dill and place in a small bowl along with the yogurt. Add in the minced/grated garlic, lemon juice, and salt. Stir to combine, set aside, and let rest while making the chickpeas. Heat a skillet over medium-low heat. Add the olive oil followed by the chickpeas, curry powder, and salt if needed. Cook until the chickpeas are hot, about five minutes. Warm the pita bread then slice in half. Stuff with ¼ of the arugula topped with ¼ of the chickpeas and a drizzle of about 2 tablespoons of the yogurt sauce. Tips & Tricks: Look for pita that advertise a pocket. I’ve run into times when I buy pita only to realize they specifically made them with no pocket. You can also make your own pita! Also, before stuffing, I like to warm the pita slightly. This can be done easily on the stove-top! If you own a gas stove-top, simply warm the pita over the gas flame. If you don’t have a gas oven, heat a skillet over medium-high heat and warm that way. This also works really well if you store the pita in the freezer and need to thaw them before stuffing!